his medical centre in Stevenage, Hertfordshire has been renovated with the addition of a glass extension that also works as a glass link between the two buildings. The double height glass extension has been created from frameless structural glass, fully engineered by IQ Projects. As structural glass was used, the glass extension is frameless. By having all walls and ceilings of this extension made from glass, IQ was able to give the spaces the maximum amount of natural lighting available. The glass roof is also made from structural glass and glass fins were used to support the outer edge glass beams and to extend the fully glazed appearance. Having this glass link between buildings allows more space for other rooms that are well lit and also sheltered from bad weather. This new extension is the perfect place for patients and visitors to sit and relax with stunning views of gardens on either side of the extension. The glass link creates an easy access route for patients and visitors to go between buildings. By having this extension, it also gives the two buildings either side a very contemporary middle in contrast to the older looking main building. 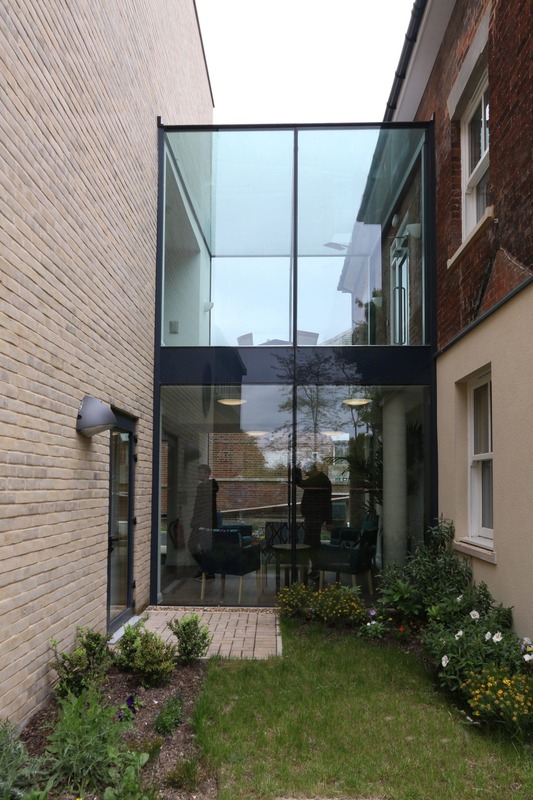 The new glass extension was designed to match the rest of the building by ensuring that the spandrel panel between floors is back painted the same as that of the entrance building. This gives the building a much neater look.